The paper presents testing results of a reactor which was in service for about 220 thousand hours in creep range and hydrogen atmosphere. It also present the research of the degree of material degradation and indicates very good correlation between NDT and laboratory (metallurgic) results. Key words: reactor, NDT findings, specimen, laboratory testing (NDT and metallurgic), material degradation, creep. After twenty-eight years of service (about 250,000 hours) the reactor at the platforming plant in the oil refinery was replaced by a new one, due to the diagnosed material degradation. The old reactor was made of low-alloyed material A387 GrC (1% Cr / 0.5% Mo), of 94 mm wall thickness. The process operating temperature was 526ºC and the pressure 32 bars. During the last fifteen years the increase in material degradation was systematically monitored and opinions and assessments made regarding its further reliable operation. Even before the Yugoslav army attacked Croatia and prior to the beginning of the war in Croatia, the condition of the reactor was very critical. Material fatigue was established, even complete degradation (of the surface), but owing to team-work and joint efforts by the equipment users, authorised inspectors and testers, the critical war period was overcome successfully, regarding fuel requirements for civilian and military purposes. The plants have performed their designated purpose, and several times the equipment was successfully protected from damages that might have ended in fatal catastrophes. Due to diagnosed material fatigue and complete degradation (of the surface), both the external and internal surfaces of the reactor were tested in detail once a year using non-destructive methods, and every half a year during the last two years. In the period between two testing, extreme worsening of the material condition was established, macro-damages - cracks at critical points, noticeable changes in structure (micro-damages) - occurrence of micropores and cavities, their coalescence and combining into chains (micro-cracks), changes in hardness (softening and hardening). These characteristics do not guarantee a steady growth of cracks since their propagation may be sudden. Therefore, it is very important to determine the condition at critical points by testing, and to insure such a testing plan that the interval between single controls is shorter than the time necessary for the cracks to form. By comparing microstructure findings and the measured hardness, there is no doubt that the material (with findings and micro-damage analysis) is in the area of 3rd level of creep and that the changes in structure were becoming more obvious with time. The reactor was replaced by a new one. A specimen for laboratory testing was cut from the upper base. After visual inspection, a detailed specimen testing plan was developed, and it included first non-destructive testing (all the methods applied in testing of objects in exploitation), and then destructive laboratory tests. The plan was made in such a way as to achieve the best possible comparability of test results, i.e. so that the obtained findings of the non-destructive method testing would be indicators of changes in properties and material structure, determined by metallurgical tests of specimens taken at the base cross-section. The analysis of test results showed that the material was completely degraded by high-temperature hydrogen corrosion, in fact by material fatigue caused by long-term operation in the creep range in hydrogen atmosphere. Testing of the reactor by non-destructive methods and material condition assessment have led already earlier to such a conclusion. However, this opinion was now fully confirmed, in fact, results of mechanical testing (destructive testing) indicated without any doubt complete degradation of the material and unreliability in object exploitation. 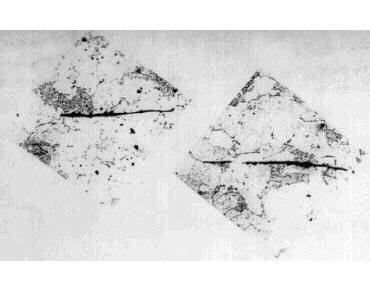 ultrasonic testing established laminar separation (blistering) in the material, that could be noticed even with the unaided eye after destroying the specimen at that point, and confirmed by metallographic inspection in a substantially greater amount, Figure 7.
imprints of the surface structure (replica) from the external and internal surfaces revealed drastic changes in the structure with cracks, confirmed by the analysis of the cross-section of the whole base thickness, Figures 8.
measurement results of ultrasonic attenuation with the aim of determining high-temperature hydrogen corrosion (pearlitic breakdown, carbide spheroidisation, carbide separation along grain edges and connection into chains, formation of pores and connection into cavities and as the final form microcracks) have given ambivalent result. Measuring through the whole wall thickness (90mm) satisfactory results were obtained for healthy material (below 0.16dB/mm), whereas measurements performed at partial thickness - on external and internal surfaces and in the middle - indicate significant hydrogen corrosion (0.24dB/mm) which is in correlation with the metallographic findings and hardness measurement results. results of testing mechanical properties did not satisfy the requirements for the given material quality, material plasticity was reduced (fall of mechanical properties) and they fully match the changes in material structure, Figure 9.
generally, the best condition is in the middle of the wall thickness (as expected), since the external surface gets damaged as result of creep, and the internal by action of the media, corrosion (with creep), Table 1. The testing of specimen of the old reactor in laboratory conditions using non-destructive methods, and destructive (metallurgical) testing, have given extremely valuable results. On the one hand, all the findings obtained by testing on the object have been confirmed by testing in the laboratory, and on the other hand, the results of testing material properties fully match the findings of structure changes. The only deviation was found in measuring the ultrasonic attenuation through the whole wall thickness in relation to partial measurements (90 and 20mm), which is in accordance with the given procedure (the procedure defines the thickness of up to 50mm). If all responsibility is rejected, efforts and dilemmas regarding maintaining the plant in function, since material was almost completely degraded, and safety was just a function of time, from the technical point of view then, this is a great advantage regarding behaviour of metal in critical conditions (high pressure, creep temperature range, extremely corrosive medium). In fact it is a contribution to science and research regarding extended life-times of materials without guaranteed properties in the border conditions of utilisation.